Unless Europeans resolve their tension between being part of a place and becoming a global player, others will decide Europe’s strategic future. A number of world leaders will attend the annual Munich Security Conference (MSC) this weekend, a kind of Davos for the international security elite. Since 2015, conference organizers have produced a report as a “conversation starter” to help make sense of today’s increasingly challenging global security environment, providing thought-provoking data and analysis on some of the key actors, regions, and issues to be debated at the MSC. This year’s Munich Security Report is both a sobering and confusing read for Europeans. It is sobering because the world has gotten much closer to “the brink of a significant conflict” in the last year. Consider the escalation in tensions between the United States and North Korea, Saudi Arabia and Iran, or NATO and Russia, alongside the fraying of international arms control agreements specifically and global governance more generally. The report’s outlook for the future security environment offers no solace to Eurocentric strategic thinkers either. Growing Russian military strength appears to mask persistent socioeconomic weakness, a very unhealthy combination. The wider Middle East contains eight of the world’s ten most lethal conflicts. Sub-Saharan Africa remains at risk of famine on top of some long-running wars (think Somalia or South Sudan). All this, while European confidence in the leading role of the United States has been shaken—albeit concerns about American unilateralism have replaced initial fears that the Trump administration would embrace isolationism. 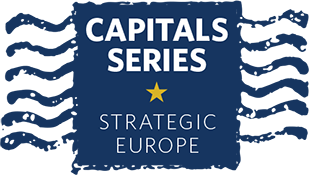 Moreover, there is an emerging realization in (some) European capitals that the rise of China is a strategic challenge as well as an economic opportunity. If what the report says about global security is sobering, then the sections covering Europe are confusing. Part of Europe is presented as a region to worry about—Central and Eastern Europe is singled out—while the EU itself is described as a part actor on the global stage. In fact, this analytical combination of part region and part actor sums up Europe’s emerging strategic dilemma. Unless Europeans resolve this tension between being part of a place and becoming a global player, Europe will remain stuck in a geo-tactical trap. This is not to say that Europeans have no influence on the world stage—they do. The EU is a crucial player for global trade, economic development, and climate change, among other issues. But on key strategic questions, meaning those involving the (current or potential) use of military force, Europeans are followers more than leaders. As a result, others will determine Europe’s strategic future. Second, more European allies are striving to reach NATO’s benchmark of spending two per cent of GDP on defense. However, the Munich report says that even if all European NATO allies met that goal, it would not be a game changer for European military capabilities, based on current national spending preferences. In other words, Europeans will not be able to contribute much more to U.S.-led military operations, let alone conduct many more of their own, unless they combine more monies and share more capabilities. But that would require Europeans to confront some very thorny questions about national sovereignty and the use of military force. The good news is that only 8 percent of respondents favored domestic deployments over all others. Even if a majority of Europeans are not fully ready to become global military actors, most are prepared to act beyond their national borders. Although it’s a sobering and confusing read for Europeans, the MSC report deserves to be widely considered and discussed. The emerging global security landscape will likely force Europeans to make hard choices. Either others will decide Europe’s strategic future, or—to make their voices heard—Europeans will have to combine their national strengths. To escape this geo-tactical trap, Europeans need to collectively decide who they are and what they want to be as a global actor. How many times must that question be asked before Europeans become strategically relevant, or remain mostly oblivious. This article and the references go to the core Europe’s euphemisms, ambiguities, individual and collective insecurities, inability to rise where it should be. The largest, wealthiest, entity in Western history, “First, … remain psychologically dependent on the United States for their defense.” It is worse. Opening the Munich Security Report looks like the continent where the Research University was invented, the continent where La Sorbonne taught for almost a thousand years, the continent where anybody could study at a Grande Ecole, the continent of PISA and Erasmus cites advice from Ikenberry and the Eurasia Group. It is not just the universities where you can get an education without having to borrow 1.4 trillion, Macron proved that you really learn something there. Still, the report recovers somehow and cites Merkel, Macron, Krastev, the UN, and it is clear that intellectually Europe could handle itself. What is not clear is how it was possible for a million refugees to create the crisis it has created, threatening the union at its core. First, these refugees came from a part of the world partioned by Sykes and Picot; second, not one of them dreamed of Poland or Hungary; third, this just the beginning, the explosive population growth combined with dwindling resources and climate change will increase this pressure manifold. Returning to geo politics and economics, the report and article miss completely the rise on India, the super hyper power of the future, especially if cooperation will replace adversity in the space that was India of the League and United Nations. SCO is ignored, even worse, Doklam. In other words, it is again Western centric, ignoring the collective rise of the Eastern realms, actually their return. It is not clear what exactly is expected from China’s economic rise, it followed a predictable path, almost identical with those taken by other powers in history. Russia has been there for a thousand years and a modus vivendi appears as remote as ever. NATO should be more than enough to counter any challenges, anywhere in the world, yet seems powerless in protecting the Eastern flank. Any serious military and economic analysis shows that Russia can’t sustain a long term conventional war; rapid de-escalation following nuclear strikes is more of a tactic, and actually an old one for any student of the Cold War. The enthusiasm for deploying military forces all over the world could be tested right now in Afghanistan, but peace is always better.